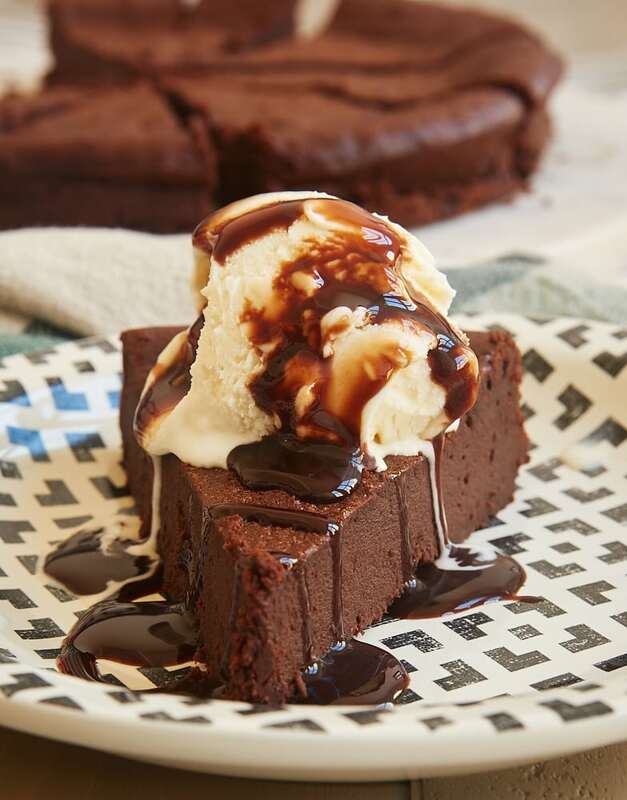 Chocolate lovers, these are for you: the best rich-and-gooey chocolate dessert recipes. For the pastry dough, in a medium bowl stir together melted butter, the 1/4 cup sugar, vanilla paste and salt. Stir in flour. (The dough will seem a bit oily.) Press the pastry mixture evenly into a 9-inch fluted tart pan with a removable bottom. (Pat the mixture into the sides first don’t skimp, they need to be sturdy then fill in the bottom crust.) Place the tart pan on a baking sheet. Bake 14 to 16 minutes or until golden, covering edges with foil if needed to prevent over-browning. Transfer to a cooling rack while still on the baking sheet; leave oven on. In a medium bowl, whisk egg until foamy. Whisk 2 tablespoons of the warm (not hot) chocolate mixture into the egg. Drizzling slowly, whisk in the remaining chocolate mixture. Immediately pour filling into the warm crust. Return baking sheet with tart to the oven, then turn the oven off. Let the tart sit in the hot oven until filling sets around edges but center 4 inches jiggle when gently shaken, 12 to 13 minutes. *Look for 60- to 70-percent cacao bittersweet chocolate. You can use chocolate disks or morsels instead of chopping chocolate bars. Using the 2 tablespoons butter, grease six 8- to 10-ounce ramekins, souffle dishes or custard cups. Place ramekins in a 15x10x1-inch baking pan; set aside. In a heavy small saucepan, combine chocolate and the 3/4 cup butter. Cook and stir over low heat until chocolate melts. Remove pan from heat; set aside. In a large mixing bowl, beat eggs, egg yolks, granulated sugar and vanilla with an electric mixer on high speed for 8 to 10 minutes or until thick and lemon colored. Fold one-third of the chocolate mixture into egg mixture. Fold remaining chocolate mixture and flour into egg mixture. Spoon about 2/3 cup batter into each prepared ramekin, dividing evenly. Bake in a 425 degree F oven about 12 minutes or until cake edges feel firm. Cool in ramekins on a wire rack for 2 to 3 minutes. Using a knife, loosen cake from sides of ramekins. Invert onto dessert plates. Sift with powdered sugar. Garnish with fresh raspberries and mint leaves if desired. Serve immediately. Makes 6 servings. In a small saucepan bring 1/3 cup of the whipping cream just to boiling over medium-high heat. Remove from heat. Add chopped chocolate (do not stir). Let stand for 5 minutes. Stir until smooth. Let stand at room temperature until slightly thickened. In a small bowl, dissolve coffee powder in water; set aside. In a small metal bowl or the top of a double boiler, beat egg yolks and sugar with a wire whisk until combined. Place over gently boiling water (metal bowl or upper pan should not touch water). Cook, stirring rapidly with a whisk, about 10 minutes or until egg mixture begins to thicken (160 degrees F). Remove from heat. Add coffee mixture to warm egg mixture; whisk until combined. Beat egg mixture with an electric mixer on medium speed about 5 minutes or until mixture is cool; set aside. Thoroughly wash beaters. In a chilled mixing bowl, beat remaining 2/3 cup whipping cream with an electric mixer on medium speed until stiff peaks form. Gently fold whipped cream, one-third at a time, into egg mixture. Gently fold whipped cream-egg mixture, one-third at a time, into the chocolate mixture. Divide mixture evenly among 6 chilled espresso cups or small glasses. Cover and chill at least 4 hours. To serve, garnish with sweetened whipped cream and a dusting of cocoa powder, if desired.